I got up early – at 8:30! Good thing we went to bed early the night before! – and left to visit my fabulous massage therapist, Carla at Equilibrium Vitae. We had a lovely chat, a great massage, and a field trip to a local youth hostel she recommends. We had an awkward moment where I said goodbye and gave her the requisite air-kiss on each cheek and then she reminded me I hadn’t paid her yet. Oops. Afterward, I looked at cheap luggage at a local shop and headed home. You see, today was supposed to be the final Game Day, but David was stressing out about Ryanair and their luggage restrictions, as we have way too many bags and way too much poundage (kilogram-age?) to suit them, and we will be flying Ryanair to Barcelona next week. Luckily, at previous Game Days, we’d seen cheap luggage at the Sporting Portugal stadium mall, so we made a trek out there to compare it to the luggage I had seen downtown in the AM. We found a perfectly sized, bright red suitcase and put it on hold. We then went grocery shopping. D & Q waited while I went back for the suitcase; then we filled it with groceries, because you can’t waste a rolling-container-opportunity like that. 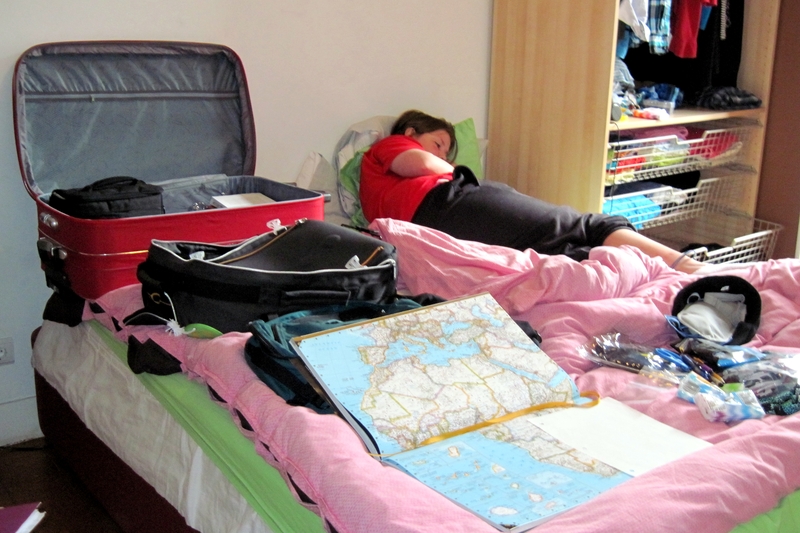 Upon arriving home, we gathered up everything we’d brought to Europe with us and spread it on the bed. After careful calculation, it was decided that we need to reduce our stuff by the equivalent of one duffle bag, one camera bag, and Quinland’s school backpack. Yes, we readily admit the following: a) all this should have been done before we left home, and b) why did we bring it all if we are just going to ditch it? There is nothing to be said in our defense. We procrastinated, we didn’t work all this out early enough, and this is the price we have to pay. You can read more about what we decided to get rid of in the end over at my Lighten Up! Blog, as I figured that “getting rid of stuff” was a suitable topic over there. No, this is not everything we own. This was just the beginning. We kept Quinland. My poor baby Q suffered through the whole thing while dealing with yet another health issue: she has become the preferred food of the Portuguese mosquito population. 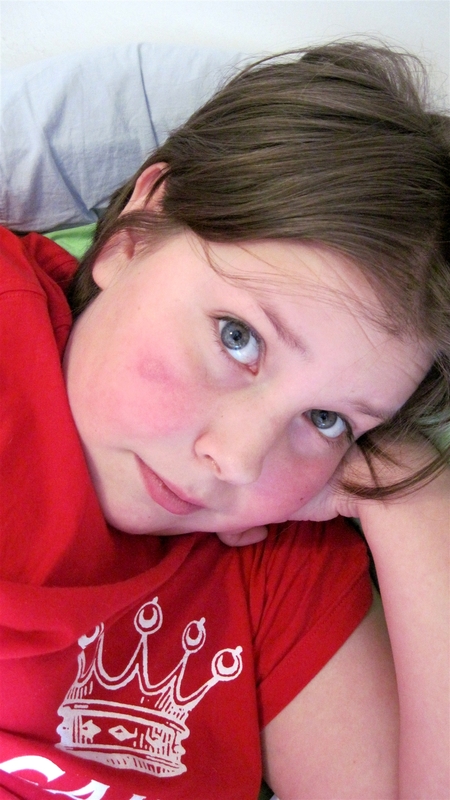 She has a zillion bites on her legs, and they are in just the right place for every single pair of her three pairs of pants – and her pajamas – to hit them and irritate them. She’s been pretty miserable. Luckily she is a thousand times better than I am at not scratching and being left with horrible scars that people point out in public and suggest might be skin cancer. I am sure that I will lose a million mom points for posting that photo of her leg… identified by name. I’ll have to remind her that I didn’t post the photo of her leg covered in hives back when I poisoned her. 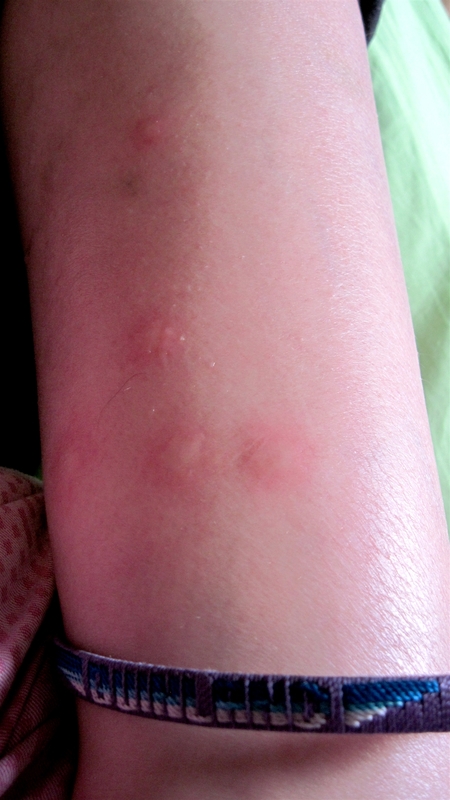 At any rate, isn’t the picture of her face so cute, even with the mosquito bite of doom? To make up for the fact that we missed Game Day – and to indulge and distract the itchy girl – we played a few hands of Dominion. David and I made fabulous pork chops in a red wine reduction for dinner (thank you, Miguel, for the fine selection of red wine), then sorted photos on Memory Manager. I fell asleep on the bed while doing so, glasses on and fully dressed. Remember this for tomorrow. Expenditures: A big red suitcase (Clifford?) and a ton of groceries. A snack for Quinland at the stadium. I refrained from spending a fortune on Sporting Portugal merchandise in their Fan Shop. I am enamored by their green-and-white color scheme. Experiences: My first visit to a European football fan shop. They’ve got some stuff I’d like to see at the Rose Garden! I considered starting a “Euro football club collection” of some sort – a postcard, a patch, a sticker from every city we go to – but was voted down. We are, after all, worried about the weight of our luggage.